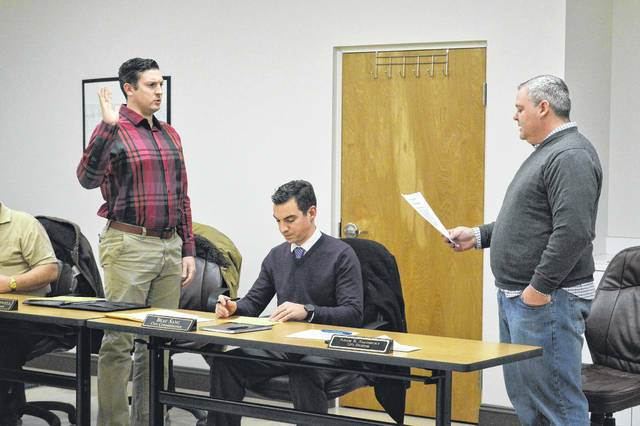 Cody Caldwell, left, is sworn in as a Gallipolis City Commissioner Tuesday evening by City Solicitor Adam Salisbury, right. Beau Sang, center, was also sworn in alongside veteran city commissioner Tony Gallagher, not pictured. GALLIPOLIS — Gallipolis City Commissioners welcomed Cody Caldwell and Beau Sang as new commissioners Tuesday evening, while Tony Gallagher returned for another term among the five commissioner seats. Gallagher’s newcomer colleagues also took the same oath before all three were congratulated by Salisbury. Veteran city commissioners Mike Fulks and Steven Wallis were voted president and vice-president of the commission for 2018, respectively. Dean Wright can be reached at 740-446-2342. Morgan McKinniss contributed to this story.